I went out with local firefighters (and Martin Johnson, the council’s Executive Member for Housing) to Copeland House on Garratt Lane this morning as they visited local residents offering a fire safety visit and free smoke alarms. They are running a programme of visits to housing estates around the borough. Recent tragedies have highlighted the need for fire safety, the Camberwell fire perhaps the most high profile incident recently, but here in Wandsworth a tragic fire over the weekend claimed the lives of a young mother and her daughter. Wandsworth has a good record on fire safety, for example council flats and houses will have smoke alarms fitted before any new tenancy. However, many still live without even that most basic protection. 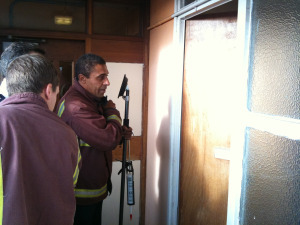 What the fire brigade were doing today was a fairly simple exercise. Having written to residents previously, they knocked on their doors today offering to fit free smoke alarms and give fire safety advice. I was amazed, however, that people were saying no! I’m not quite sure why some people were hesitant, there’s no catch and no-one is bothered about your home being a mess. Personally, if I was offered something that might save my life, and offered it for free I’d be taking the offer up. In fact, I am taking that offer up. Chatting with one of the fire-fighters I realised that our house probably isn’t adequately covered, so I’ll be booking in for a fire safety check. You can either book online, email smokealarms@london-fire.gov.uk or call 0800 028 4428 to get one for free.